There’s nothing quite like springtime in coastal Orange County! And as Spring begins taking full effect and the weather starts warming up, we are also on the lookout for homes that take advantage of our amazing coastal climate; plus, we don’t think it’s ever too early to start planning for Summer! Listed by John Stanaland with Villa Real Estate. Listed by Kim Bibb with Villa Real Estate. 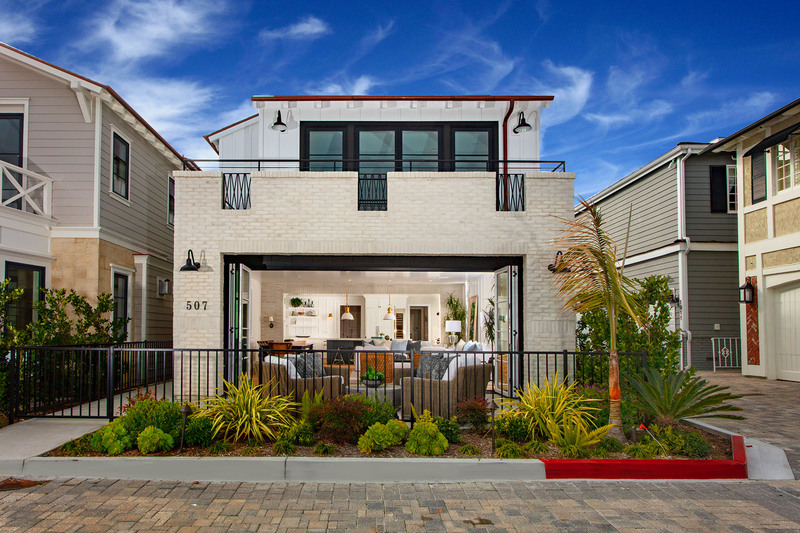 Premier location just one home from the bay, 507 L St is a remarkable, custom new build home offering 4 beds & 5 full baths on Balboa’s highly sought after Peninsula Point. A warm California coastal farmhouse feel is brought to life with architecture by renowned Brad Smith & interior design by the talented Serendipite Designs. Layers of texture elevate the 3,255 sqft of interior living to a sophisticated comfort begging you to unwind. The main level enjoys a great room feel with kitchen opening to a large dining area, living room & outdoor patio. Fit for a chef, the kitchen has a huge island, striking La Cornue CornuFe range, Sub-Zero built-in refrigerator, wine storage & Calacatta counters. The main level also offers a prep kitchen complete with Wolf coffee system & guest room with ensuite bath. The 2nd level offers bonus room, 2 guest suites, & master retreat - complete with fireplace, balcony, 2 walk-in closets & freestanding Victoria & Albert Amiata soaking tub. Quality craftsmanship & attention to detail can be seen on all 3 levels of the home; from stunning wire-brushed European Oak wide plank flooring, masterful staircase, Kolbe windows & doors & fine custom finishes throughout. To complete this one of a kind home, the 3rd floor offers a California room with spacious deck ideal for entertaining, enjoying the ocean breeze, gazing at the sunset & taking in city light views at night. An elevator serves each level making this home the ideal 2nd home or permanent residence. Listed by Harold Parker and Jeanne Carni. Live in this magnificent estate, right on the most scenic beach in the Newport Harbor……a true “toes in the sand” location near the Newport Harbor entrance on the Corona Del Mar side You’ll enjoy dynamic views here, and you will delight in the abundance of elegant features found throughout this 5700 (approx.) square foot living space, including Honduran mahogany windows, doors, ceilings, and millwork, leathered travertine and Brazilian cherry wood plank floors, Caesar stone counter tops, curved glass stair railing and much, much more. Live the Indonesian resort lifestyle in China Cove. At the center of the home, you’ll find a breathtaking open atrium adding unparalleled tranquility and beauty to the living space. There are a total of 4 bedrooms, 4 bathrooms, plus a powder room. 2 offices, a secondary family room on the top level and a cozy rooftop deck with a fireplace. Boasting a caterer's kitchen, which includes a Wolf six-burner cooktop and two ovens, 3 additional ovens, a sub-zero refrigerator/freezer plus 2 additional refrigeration drawers, a warming drawer and two dishwashers. This large home features a great room which includes a living room area, media room, and morning (breakfast) room. Completely refreshed to as new condition. Hidden within the prestigious guarded gates of Crystal Cove, this rare single level estate offers ultimate privacy and stunning views of the Pelican Hill golf course, reaching out to Catalina Island with no rooftops obstructing the amazing ocean view. Secluded at the end the Timor Sea cul-de-sac, on an oversized lot, neighboring only one home. Wide double doors offer a welcoming entry to the great room, highlighting impressive pass-through views of the backyard and beyond. Each detail throughout has been carefully hand-selected, from the origin of stone and woodwork to the custom twelve-foot live edge floating shelf, and the calmly focused sound of water just outside the office. A sprawling backyard made for entertaining, offering an outdoor fireplace, built-in bbq and bar, newly done impeccable landscaping, a new refinished, very high-quality pool and spa. The master retreat hosts ocean views, a fireplace, a separate massage room, en suite oasis-style bathroom, and spacious walk-in closets. The tower-top casita features an en suite bath and balcony, overlooking the property’s entryway with its own private entrance. A hallway lined by dual wine walls marks the path to a true chef’s kitchen, with professional grade appliances, an expansive island, and a large butler’s pantry. Including five different cozy fireplaces, two of which being on the exterior of the home. Offering more than could reasonably be represented by words, this unparalleled estate is immaculate in detail. Listed by Heather Saito with Villa Real Estate. 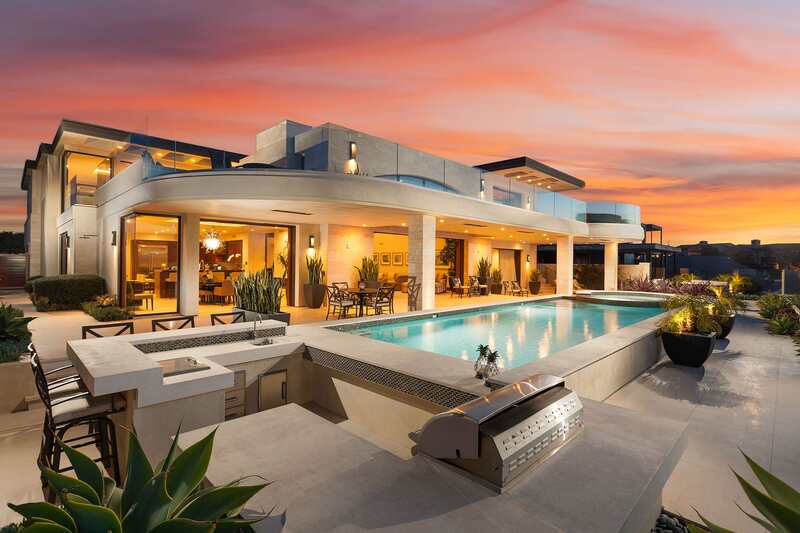 You will enjoy stunning sunsets and panoramic ocean views from this designer perfect Villa in Crystal Cove. The main house is 3 Bedrooms plus an office/den, 3.5 baths. Additionally, there is a private guest casita with 1 Bedroom, 1 Bath and its own outdoor deck. Exquisite quality and attention to detail throughout the residence. Gourmet Chef’s Kitchen with top-of-the-line Viking appliances, marble countertops large center island with vegetable sink and walk-in pantry. New French oak hardwood floors and custom built-ins throughout. The master suite opens to the rear yard and boasts a fireplace, dual walk-in closets and a luxurious bathroom with stone countertops, dual sinks, large roman tub, and separate shower. Each secondary bedroom is en-suite with its own private bath. 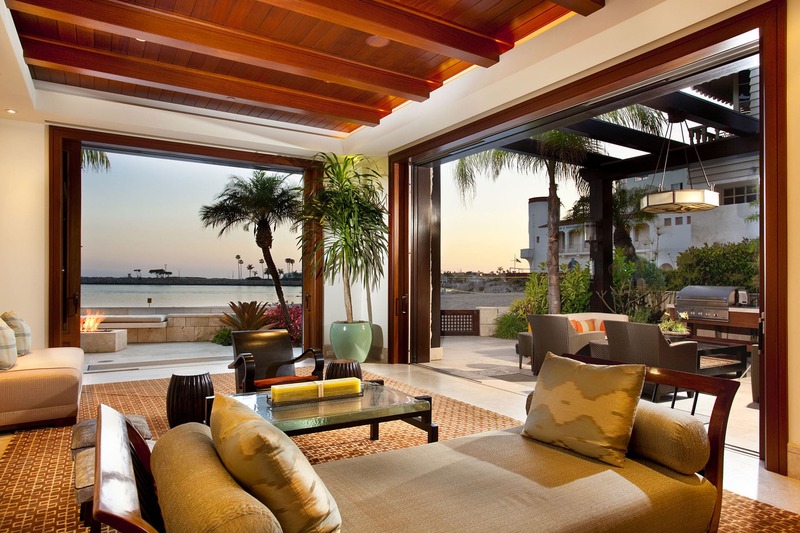 Indoor/outdoor living at its finest with French doors opening to a deck/balcony or patio from almost every room. A truly must see property. Crystal Cove community amenities include 24-hour guard gates, pool, spa, tennis courts, clubhouse, outdoor barbecue/picnic areas, gym, access to hiking/biking trails and private access to Crystal Cove beach. And if none of these beautiful homes quite fit what you are looking for, we’re sure your dream home is still out there. Ready to find your next place to call home? Our agents specialize in all of the Coastal Orange County submarkets and are ready to help you find your dream home.